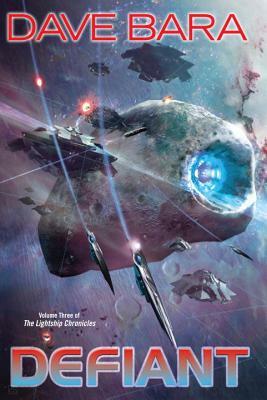 With his critically acclaimed military science fiction debut series, Dave Bara launched readers on a star-spanning journey of discovery, diplomacy, and danger. Peter Cochrane and his new wife, Karina, have been married less than a year. And although things have been quiet in relation to the old Empire during that time, they’re about to get a lot hotter. Peter and Karina have embarked on a diplomatic mission to Sandosa, an old ally of Pendax, the newest member of the Union. But during their mission the government of Sandosa attacks Peter’s new command, Defiant, and tries to assassinate Karina and him. Peter responds the only way he can, with all the power at his disposal to protect both his wife and Defiant. Then suddenly Defiant is called away to Skondar, where Peter’s old flame Dobrina Kierkopf and her new ship Impulse II have come under attack by the Butcher of Carinthia, Prince Arin. Though Defiant chases away the prince, it is not before some pretty devastating events have occurred. And soon Peter finds himself racing toward the mysterious world of Altos, where he discovers an unpleasant truth about the Union’s allies, the Historians of Earth. Each encounter with Arin and his allies leaves Peter and the Union Navy fleet reeling, even as they continue to pursue this elusive enemy. But all of this can only have one conclusion, a final confrontation in which Peter and Arin will battle over the future of humanity—Union or Empire. Dave Bara was born at the dawn of the space age and grew up watching the Gemini and Apollo space programs on television, dreaming of becoming an astronaut one day. This soon led him to an interest in science fiction on TV, in films, and in books. Dave’s writing is influenced by the many classic SF novels he has read over the years from SF authors such as Isaac Asimov, Arthur C. Clarke, and Frank Herbert, among many others.